Screen door locks and latches are usually the kind of parts that you really need but no one seems to have the right part. Window companies change their parts over the years and often the parts used by your windows become unavailable. On the other hand, some parts have not changed in forty years. This is true of many screen door parts you will see below. We have a cat that needs to remain indoors- however- he loooves the outdoors and very easily can get our sliding screen door to slide open for him by pawing at the base opening. Our only solution is to lock it but if we are outside, obviously this doesn't work so well! We were hoping to find a dual sided lock that can be accessed if we are in or out. Haven't been able to find one yet. We have tried using strong magnets but that doesn't work. Any ideas???? There are a number of different screen door closers that automatically close the door after its been used. One of the simplest ones works like a retractable leash. It has a string which attaches to the door and a plastic housing which mounts to the jamb. My sliding screen door has a handle but NO LOCK. The jamb has no latch to lock on to. My 13 month old wants to get out, its so nice outside on southern california, it's days before she figures out how to slide the unlocking screen. Are there kits that come with an after-market latch? What terminology am I missing to describe a screen door latch/lock? There are several surface mount locks you can install. I have uploaded a picture of one of them. Make sure there is room between the patio door and screen door for the lock. Having trouble finding a latch for our sliding screen door. It's an inside latch only, do they still make them? I uploaded a surface mount style screen door latch picture and a link for the same lock on Amazon. These locks mount right on the inside of the screen door. They work fine if you have room between the sliding door and the screen door. Some screen doors have no clearance at all. If thats the case it still might be possible to replace the mortise style lock that was originally built into the door. We have a screen door and the locking mechanism is now broken. My husband said he can't find the replacement part and he said that to fix it we would need to replace the whole door. Is this true? This sounds nuts! Is there a way to fix the locking portion? Right now we are using a screw driver everytime we need to get in and out of the door. Can you tell us where we can get a replacement part or how to fix this so we don't have to do this everytime? Hi Dena, I have a few different kinds of locks that you can mount on the screen door to take the place of the one thats broken. If you can post a picture of the lock you have, I might be able to tell you if there are parts available for it. i have a really old sliding screen door about 56-60 yrs old.i havent had any luck trying to find a lock to replace the very old one i have now,so if you can help me in any way i would greatly appreciate it. Where can I find the screen door latch as shown in the picture ? I have tried Home Depot but they don't have it. I live in Vaughan, Ontario. A glass shop would be the best place to look, there have to be some in Vaughan. Many of Canada's biggest window companies are in Vaughan. My catalog shows 9/32", 7/16" and 11/16" but not 1/2". The 7/16" should work if you stuck a washer or two behind it. If you have no luck at the glass shops call or email and I will see if I can pick one up and mail it to you. I have a Pella sliding door with the screen on the inside. Early summer it quit staying out of the way. It should have a catch of some sort to keep it in place, but I think it fell out. I found a plastic piece laying on the floor below. I have attached a photo of the plastic piece. Can you tell if it is broken or just needs to be put back in. If I can put it back, please show or tell me how. I am not sure how old the door is. We just installed a new patio sliding door and screen. Everything works fine except when you close the screen or don't close it softly or bump it it will open. There is a latch/lock but not for when you are not outside. There is nothing to keep it closed. 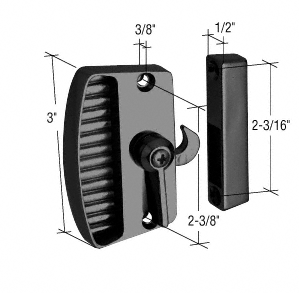 Do you have any suggestions of a tension latch or magnet catch? Thank you for your help. A screen door closer might do the trick. Is there a device I can mount to the patio screen doors that once you open it, it auto shuts ? Yes, there are a few different types of spring loaded automatic closers. I uploaded a picture of one of them. 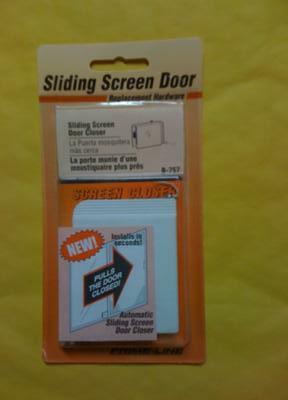 You attach the square plastic housing to the screen door with a screw or double sided tape, then hook the line to a screw in the door frame. As you open the door, the spring tension automatically closes it behind you. I'm looking for a replacement door latch. Attached is a picture, It's a simple latch which as you may seen the housing cracked. I don't want to replace the whole door and as you may imagine I'm having trouble finding a replacement. I rely on this door because the latch does lock from the inside and my cat uses a cat door in the bottom of it to get in and out of the house most of the year. So it's a storm door that serves for security purposes too. 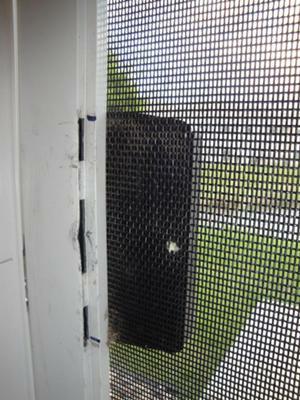 I am looking for a new screen door latch/handle to replace one that broke off. I have attached a photo for you to review. I have looked at the hardware stores in my area but have had no luck. They did have a few handles in stock however none of them were the correct size. The size of the handle is 4” with two pegs that slide into the screens frame on the inside handle. The outside has two screws that secure the handle to the frame. However mine is about 3 & 5/8 inches center hole spacing on the outside. Where can I get a replacement handle? 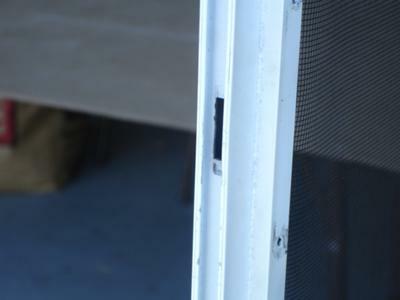 The pulls used on sliding screen doors are pretty much standardized. A lot of them use the 3-1/2" center to center distance. If you cant find what you need in Loews or Home Depot just contact me and I will provide you with a handle that will fit. Kids playing at my house keep poking holes in the screen around the handle of my sliding screen door. I have seen protectors that snap on around the handle to prevent this. Do you have some? I have had no luck finding them. Find a sharp drill thats just a little bigger than the diameter of the rivet. Gently start drilling right through the head of the rivet. I have an aluminum sliding glass door with a riveted on handle that needs to removed to get the spline out. You cannot get the spline tool in there because of the closeness of the handle and it is riveted in place. You will need to drill the heads off the rivets that hold the handle on. Use a good sharp drill almost the same diameter as the head of the rivet. One little touch or two with the drill should be fine. Dont push too hard or you will make the rivet holes too large and you wont be able to put new rivets back in. Need help finding my latch. 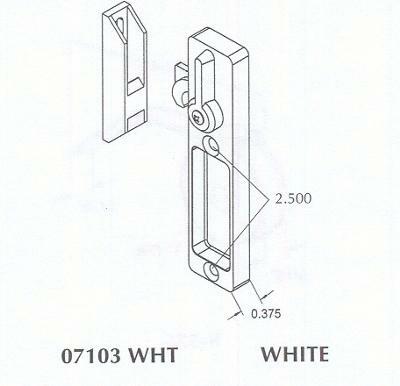 I am looking for the latch part for this screen door handle. Any advice would be appreciated!